VizLore Interview: How Will the IoT Create More Intelligent Buildings? VizLore platform is physically divided into two computational strata: a) Edge Computing is applied and distributed across connected devices and networking elements. It enables tactical data processing and serves to improve service resilience. b) Cloud Computing: Orchestration of distributed computing and service integration across the edge devices happens in the cloud, as well as more strategic oversight and workflow control. Here’s a video that explains the architecture. In covering the growing power of the open source/open data movement in commercial buildings, I learned about VizLore and its Software-Defined Network (SDN) approach. SDN is an open programming model that is foundational for new Platform as a Service (PaaS) IoT applications like VizLore’s. VizLore soft sensors and analytics derive insight and value from data sources that range from occupant personal devices, building infrastructure, and public-domain information. Sometimes it feels like experienced Smart Buildings practitioners and those that want to bring hyperconnectivity and the Internet of Things into buildings speak two different languages. Not true with VizLore. CEO Dragan Boscovic explains in this interview how It’s all just moving data. Therese Sullivan: There is a drumbeat right now about how the current incarnation of Smart Buildings has left people out of the equation and about how the next incarnation – the Building Internet of Things – will be driven from an ‘occupant productivity and comfort -first’ perspective. How will the IoT give rise to truly intelligent buildings that fit this description? Dragan Boscovic: While IoT will be a radical and beneficial change to the way we currently live, work and play, the reality of IoT is that we will have a lot of connected devices, sensors, wearables and appliances that all come with their own set of functionalities, but that don’t know how to talk to each other and make sense of the data they collect in a way that is meaningful as a whole. So, to derive actual long-term value from IoT, you need a way to make sense of it all. The way to do that is to implement a smart software defined network that will act as a private in-building information backbone that can, in addition to providing better security and data privacy, also orchestrate all the devices and flow of data. In return, you get actionable insights into things like your operational efficiency, use of resources, geospatial analysis, or even the social dynamics of your building. Why is it essential for an intelligent building to have a platform that supports both edge and cloud computing? Since the software part of the network sits in the cloud, it can be easily updated and re-defined to suit any future need and to maintain security, without needing to have an IT person on premises to deal with it all. When this software defined network (SDN) is complemented with edge and fog devices (such as switches, firewalls, IP cameras, sensors, bluetooth beacons) it opens up a whole new world of possibilities for the creation of added value IoT services. For example, you can create automatic commands for the building so that you can save energy or enhance security. The fact that VizLore’s SDN picks up sensory data across the connected edge devices means that it can compile information from different sources and transform it into a “software sensor” (or soft-sensor) that can then be combined with lots of other soft-sensors to provide actionable recommendations. How does your soft-sensor approach democratize data analytics? Our cloud SDN is open and nonproprietary, so any types of devices, sensors, appliances, wearables etc. can be connected to it, and data extracted, in a way that is ultimately useful to the end user. Democratizing this process is necessary to allow the IoT to function at its full potential. If you have a bunch of cool tech solutions throughout your building but they have no way of communicating with each other, how are you going to use them to create an impact for your tenants or for your building management team? How does the combination of a SDN and open source platforms (like EnOcean Alliance, AllJoyn and Project-Haystack) add value to a building? Not everyone’s SDN platform is open. Well-known open source technologies like Project-Haystack for self-describing data models, EnOcean for self-powering wireless devices and AllJoyn work well in the context of our private software-defined network precisely because it is open. Project-Haystack is working toward standard tagging and semantic modeling of building elements (such as lights, thermostats and HVAC equipment ). AllJoyn allows devices to become discoverable amongst each other to create ad hoc networks for information sharing. An open SDN means that these platforms, and others like them, can be integrated within the network infrastructure, and in turn can be used to create soft sensors that will extract information from each side and repackage that data to make it more understandable as a process in the larger context of the building’s operations. You can have real-time information flow about the whereabouts and functionality of certain critical building components, where a suspicious dataset could trigger an automatic response and message to the facility manager and/or maintenance crew. VizLore is a Google Technology and Service Partner and builds upon the Google Cloud Platform and Google Compute Engine. What are the advantages? With Google infrastructure behind our cloud-based platform and software-defined network, we don’t have to worry about managing infrastructure, provisioning servers and configuring networks. We focus on how we can help customers optimize critical business processes through soft sensors and data analytics. Google wants to stay at the forefront of innovation in machine intelligence, so it’s a natural partner for VizLore. Our soft sensors bring together data formats familiar to Smart Building practitioners, like Wi-Fi, Zigbee, AllJoyn, Project-Haystack. And they are dynamically created and managed through APIs to our cloud-based platform hosted by Google. 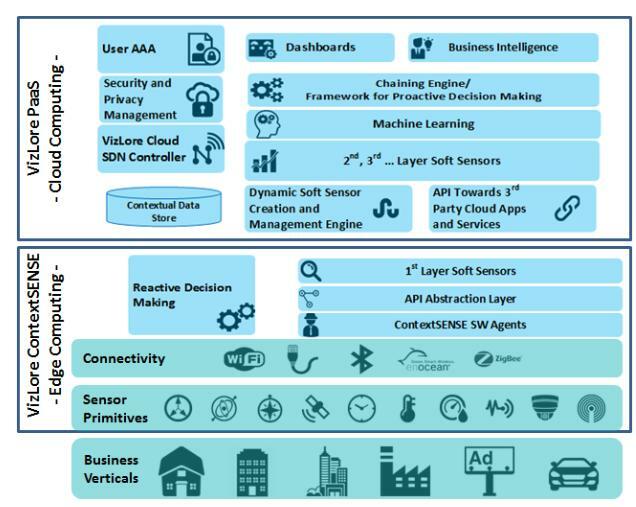 What kinds of IoT Apps can be built upon such an open, flexible and secure framework? Can you give an example of an IoT application for intelligent buildings? Lots of cool new modern services can be supplied through an IoT-enabled building structure, not only to building managers but also to tenants. One potent example of this is a revolutionary enhancement to an old, ingrained building system – the intercom. By connecting the electric door to the SDN, residents can now use a smartphone device as a virtual key to access the building! Real-time access logs are created that integrate surveillance camera feeds for every entry. The VizLore app for smart access also lets tenants create virtual key codes for their guests. Imagine you have a dog walker that comes by once a day, or an out of town guest that is here for a long weekend – now you can issue them a personal code to enter the building (instead of cutting a key). The virtual access codes have either a one time or multiple use life span that you decide when you create it. You can cancel the access code, or block a lost or stolen device from having entry rights, at any time, from the app or an online web portal. Building managers have a further array of options for building security purposes: they can override any codes created or any devices granted access, block a specific tenant or unit from generating access codes, update the tenant directory online, and schedule events (like directory updates and blocked access) to coincide with move-out dates. With an IoT-enabled intelligent building, you can build any service to bring old processes into the 21st century. Your imagination is really the only limitation.